Transaction Types are used to properly record the type of fee and payment transaction. They are used for reporting and for searching information in Jackrabbit. Credit transactions will decrease a family's balance and Debit transactions will increase the balance. Some Transaction Type fields have already been included for you. Several are reserved for Jackrabbit functionality and can not be changed or deleted. The pre-assigned Transaction Types are a great starting point; but it's easy to create more. Click Transaction Types from the Transaction section in the left list of choices. Click Add Row to add a new Transaction Type. Enter the name of the Transaction Type and select Debit or Credit from the drop-down list. This tells Jackrabbit whether the transaction should debit or credit a family's account. Click Delete to delete a Transaction Type. Save Changes. Note: Deleting a drop-down value can affect your historical reporting. Review the Frequently Asked Question before editing or deleting a drop-down value). 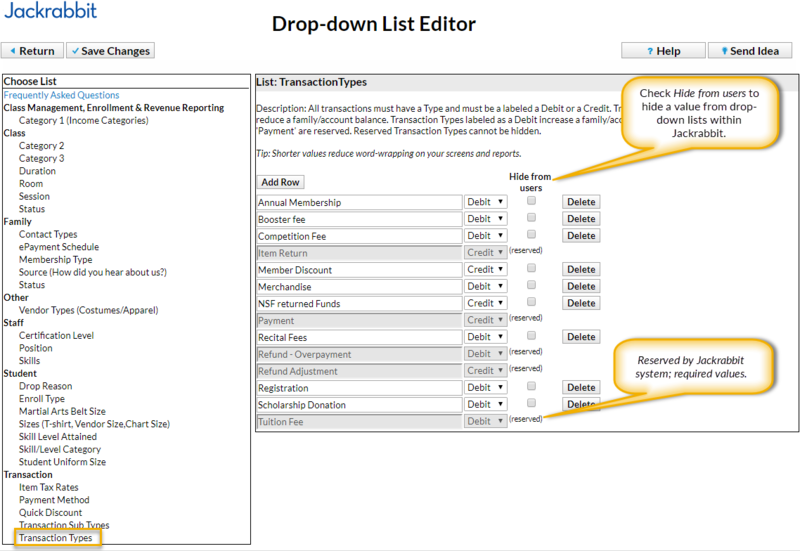 Check the Hide from users checkbox next to a Transaction Type to hide it from all of the drop-down lists in your database. This can be especially useful when you are no longer using a Transaction Type but want to retain your historical reporting for it. Deleting drop-down values in Jackrabbit is not recommended because it impacts your ability to filter for that value in your reports.